Before moving on to The Best Buffalo Seitan Bites here is a disclaimer: Housevegan.com is a participant in the Amazon Services LLC Associates Program, an affiliate advertising program designed to provide a means for sites to earn advertising fees by advertising and linking to Amazon.com. This post does contain affiliate links. ..and might be tied with that recipe as our official favorite food of the 2015 football season. We made and ate these a lot, y'all. By ourselves, with our friends, with family, for breakfast, dinner, midnight snacks. The "Big Game" is this weekend, and I'm both excited and bummed. It's the last football we have until this upcoming fall. Which is 232 days away in case you didn't know. Well, technically my team's first game is 213 days away but still. This is the last time I'll get excited to curl up on the couch for sports and game food for 200+ days. Not that anyone is counting. I know what you're thinking when you look at this picture. You're thinking "Um, is that white wine?". We spent years in California watching USC games, eating game day snacks, and drinking wine. We weren't beer drinkers yet, and when the wine is as good as it is in California? Why not? I served this platter with wine because I've been in a California state of mind for weeks. I love Texas more than any other place on Earth, but I miss CA's wine, beaches, and Disneyland. So I've been doing Californ-ey lately to ease my longing. It's fitting because it's where I first started watching football. I've been calling these "game food", but I don't think I'm going to be able to wait 213 days to eat them again. If I spent years drinking central coast chardonnay while screaming obscenities at refs in our Burbank bungalow then I think I can eat these in the middle of Spring. Though I know that these taste best in the fall. Like most things. 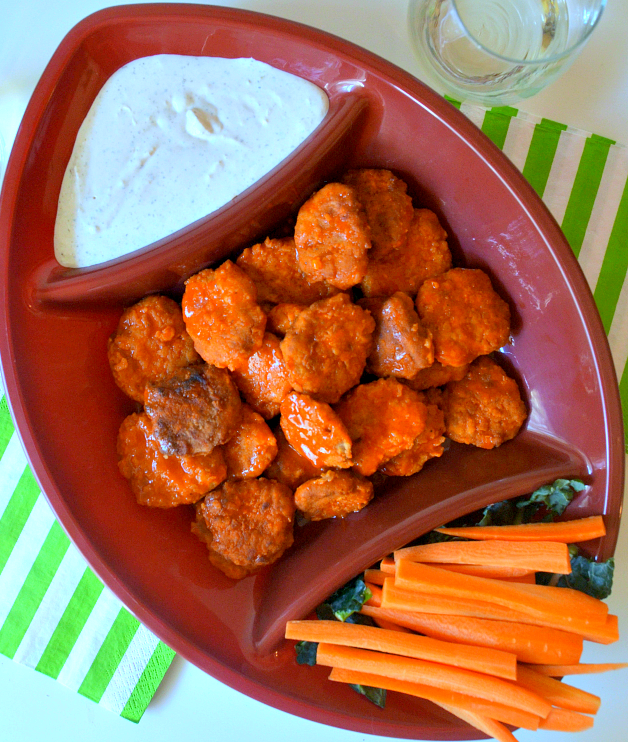 My Buffalo Seitan Bites are tender yet chewy, and the perfect size for snacking and dipping. They're baked to keep things easy, and then breaded and fried to keep things delicious. 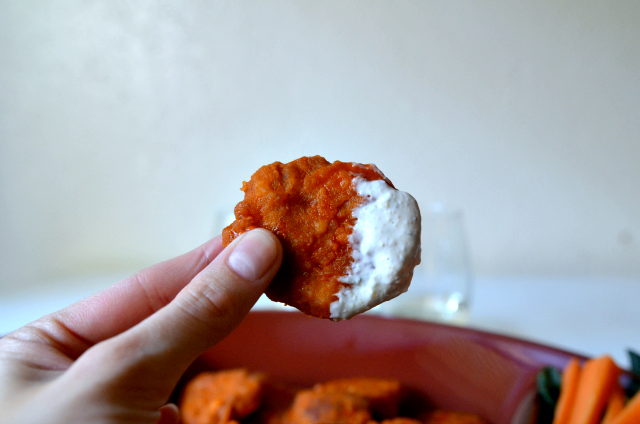 Then they're coated with buffalo sauce, and served with vegan ranch or goddess dressing (Hampton Creek's are amazing!) and carrot sticks/no celery. 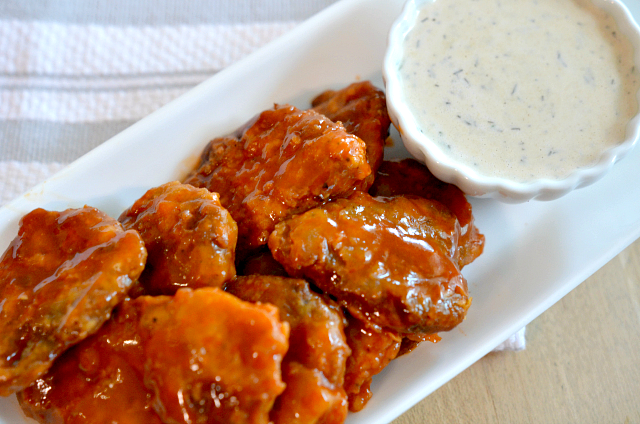 They're unhealthy and the perfect indulgence when you're craving game day eats. Happy snacking, and may your favorite team win. Or may the commercials be ever-entertaining. Whichever is your priority. 1. Pre-heat the oven to 350°F. Cover the bottom of a large baking sheet with parchment paper or a silicone baking mat, and set the pan aside. 2. Place the seitan dough onto the counter or other flat work surface, and form it into a log shape, and cut the log into thirds. Cut each third in half. Cut those pieces in half, and then in half again to make 24 pieces. Flatten each piece into a nugget shape about 1/4-inch thick. They’ll puff back up almost immediately, and that’s fine. After they puff back up, they should be about 1/2-inch thick. 3. 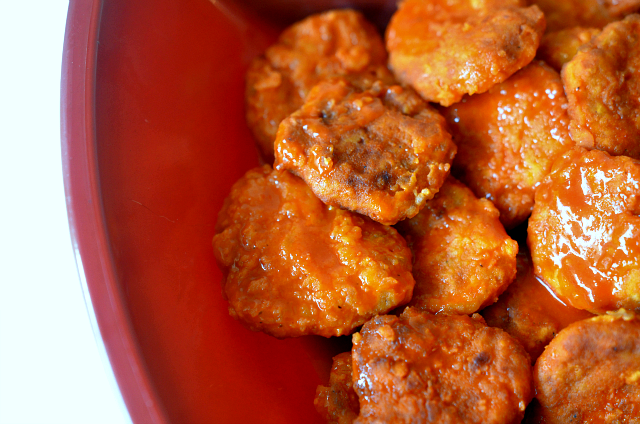 Place each seitan nugget onto the prepared baking sheet, leaving 2 inches between the pieces. Spray the seitan with oil spray, and cover the whole sheet with foil, making a tight seal. 4. Bake the seitan for 10 minutes. Remove the nuggets from the oven, uncover the baking sheet, and flip over each piece. Re-cover the pan, and cook the seitan for another 10 minutes. Remove the nuggets from the oven, uncover the baking sheet, and allow the seitan to cool to the touch. 5. While the seitan cools, prepare your sauce coating. 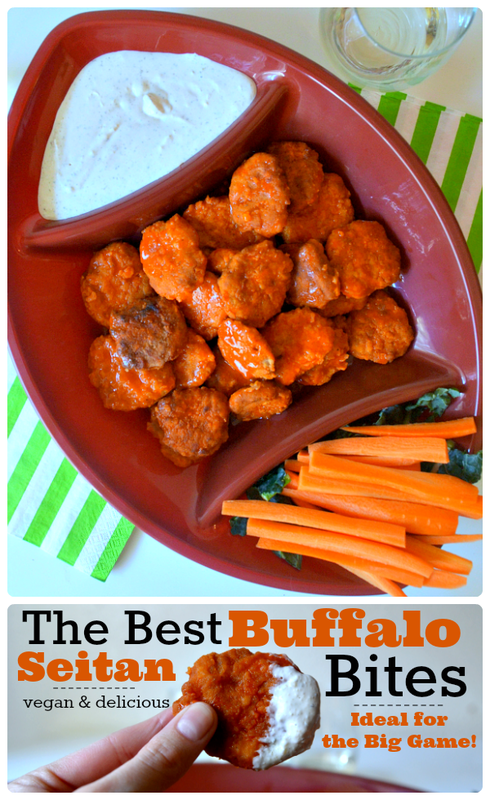 Add 1 tablespoon of the buffalo sauce to a shallow bowl, and set the rest aside. Add the milk to the tablespoon of sauce, and whisk them to combine. 6. In another shallow bowl, combine the flour, salt, and pepper. 7. 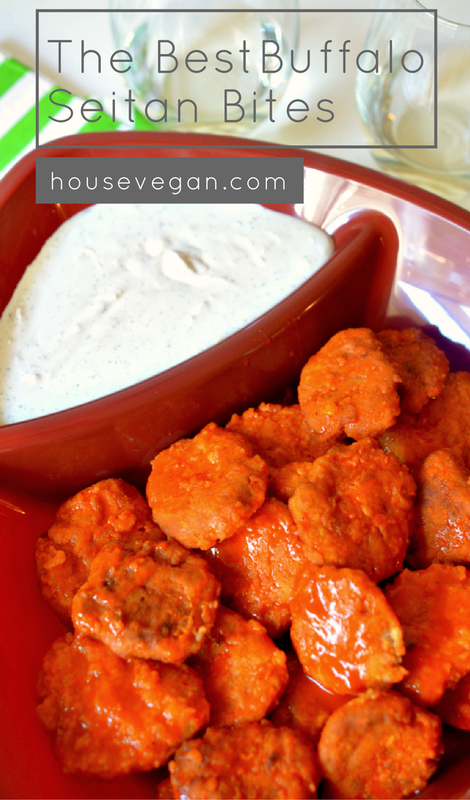 When the seitan is cool enough to handle, dip each piece into the flour mixture, then into the milk-buffalo sauce mixture, then back into the flour. 8. Heat a thin layer of vegetable oil in a large skillet over medium heat. Add a few seitan pieces, and fry them on both sides until they’re browned. Place the fried pieces on a paper towel to drain, and continue with the rest of the seitan. 9. 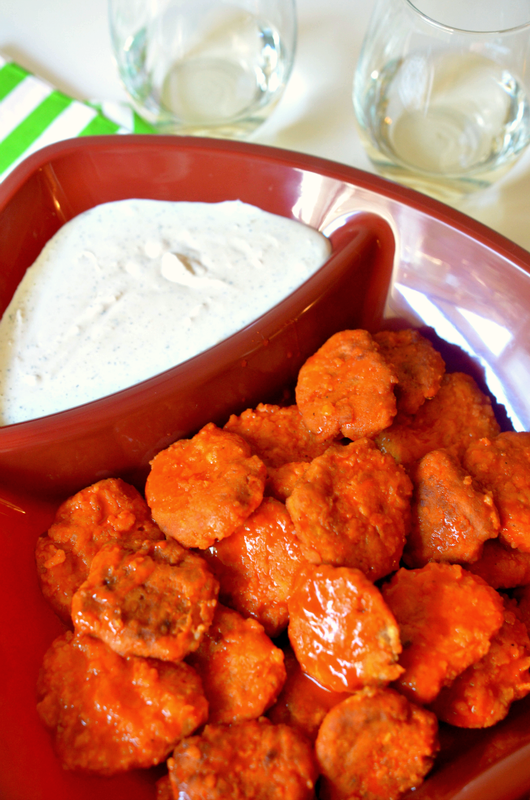 Add all of the fried seitan pieces to a large mixing bowl with the buffalo sauce, and toss them with tongs to coat them in the sauce. 10. Serve your seitan bites immediately with vegan ranch dressing and white wine if you're feeling Californian. 1. Combine the vital wheat gluten, chickpea flour, garlic powder, onion powder, smoked paprika, and salt in a large bowl. Add the broth, and use a spatula to stir everything together until a ball forms. Place the seitan onto the counter or other flat work surface, and knead it a few times to work the gluten until it’s springy. (This should only take a minute or so.) It’s now ready to use.